It is always important to prepare your hot tub for the all-important spring/summer season. Taking a moment to look over and prepare your spa will go a long way to making sure you are able to enjoy your spa all through the warmer months without trouble. Here are some simple easy-to-follow steps for cleaning and replacing your water filter, one of the most important elements of your spa maintenance schedule. How long can you expect your spa filter to last? 10-15 cleanings is standard. After this, it is time to replace the filter completely. 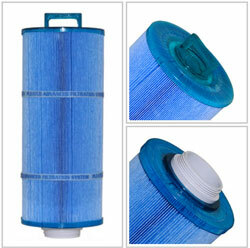 Experts indicate that you should change out your filter every 2-3 weeks. Experts further recommend that you should pre-rinse your filter every 3-4 months and then let it soak overnight in a filter cleaning solution. Remember, that oil, body lotion or soap of any kind will put a strain on your water filtration system and will require your filter to do extra duty. Rinsing off before entering your spa will help to keep your water clean and fresh. Another tip is to rotate your spa filters. As part of the cleaning process, switch out your filters with a clean, dry spare. Allowing your filter to dry completely will help destroy any lingering bacteria. Finally, filters should be completely replaced every six to twelve months. Following these simple steps will make sure you have hours of enjoyment in your Cal Spas during the coming months.